Molly Jobe 16MN helped train nurse-midwives in the village of El Rancho in central Guatemala. Student interest in global health has never been stronger. This past year, a record number of students worked at clinical sites in the Dominican Republic, Jamaica, the Bahamas, Puerto Rico, and other locations. For the first time, faculty members Ursula Kelly PhD FAANP and Gladys Jusino Leon DNP RN accompanied students to Nicaragua to work with the organization Communidad Connect on health promotion and preventive care. 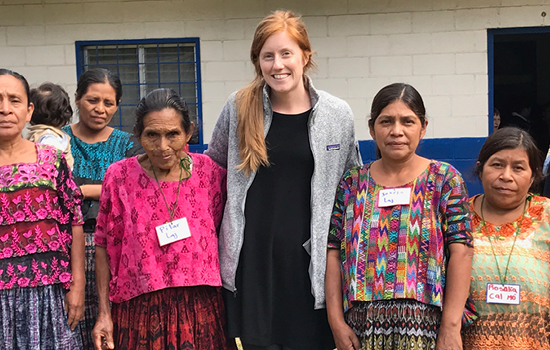 Last fall, four Emory midwifery students trained midwives in rural Guatemala in a project piloted by faculty members Jennifer Foster PhD FACNM FAAN and Sydney Spangler PhD CNM. The School of Nursing launched the project in partnership with the Guatemalan ministry of health and Casa Materna Ana Sayre, a birthing center founded by retired Presbyterian minister Anne Sayre 57N. The center seeks to reduce maternal and infant mortality in a region where mothers often walk several hours to seek care. It houses women in the final days of pregnancy and transports them to a nearby medical facility for safe delivery.